I can almost smell it: the end of the expansion process. This was supposed to be my final expansion, however I wimped out and we only added 25ccs to each expander, for a total of 525ccs/side. The goal is 550ccs, so I have another appointment for the final FINAL expansion in one week. The reason for halving the volume is pain. The last expansion brought on a lot of pain. Not that I thought it was going to get more pleasant, but it was pretty bad. As usual, the worst of it come early in the morning. I’ve never dreaded getting out of bed so much. As soon as I sat up, gravity would work its magic. Talk about grumpy mornings. The pressure was intense and I was on ibuprofen for about three days after. It didn’t help that we spent that weekend camping, so I was not sleeping in my own comfy bed. I really thought if someone poked me, a foob would pop. I even had a dream that my cat sat on my chest and the thing just blew up under her. Not like a slow deflation, but a violent explosion! I woke up in a sweat and immediately groped my chest to make sure everything was still there. Whew! Enjoy the pics. It’s getting crowded down there! 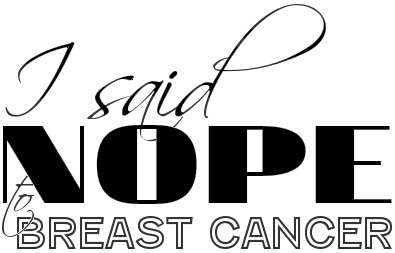 This entry was posted in All, Expansions and tagged BRCA, breast cancer, breast reconstruction, health, Mastectomy, Plastic surgery, Tissue expander on July 12, 2013 by nope2BC. You’re almost there. It sounds a lot like the feeling after childbirth when your milk comes in, all at once! Rock hard. Yeah, the initial part of breast feeding is not the pleasant part of the experience. But we worked out the dance of nursing as do most moms and their babies. Wow! I would stay away from cactus for a while 🙂 One more!! Yay! Nearly there and looking good.. No explosions please!!! Thank you for sharing. I greatly admire your forthrightness, courage, and willingness to share. And yes, you are going to look fabulous! They are beautiful!!! So glad you’re near the end.